WebRTC is coming of age (it's 5), and it is taking over! It stands for Real Time Connection and it is an amalgamation of old web technologies, and a few new ones, that let people connect directly to one another over the web. What is the promise of WebRTC? Tons and tons of interactive tools that go well beyond discussion boards and clicker questions. Why have I not heard of this before? For the first four years of WebRTC development, browser support (and especially inter-browser support) was spotty; this made WebRTC somewhat unattractive for developers of cool new tools because it meant that most of the people who tried to use it would have a bad time. What does the coming of age of WebRTC mean for me? It means that there are going to be an endless stream of super cool, interactive tools flooding the market; such as Kahoot and YouSeeU. Kahoot is like clicker questions on steroids. It provides the ability for users on any device to participate locally, remotely, alone, or in groups, LIVE, with other students and educators. It is easy to set up, it is free, and getting started is a breeze. As you may know, YouSeeU allows students and educators to engage in real time, rich video chat and numerous live communication assessment types. As more and more tools like Kahoot and YouSeeU get built on top of WebRTC, the gamification of education will begin to come alive and the sense of being involved with a group of people (when engaging in long distance learning) will get stronger and stronger. Hooray WebRTC and hooray interactive learning! The Fusion conference covered a wide range of ways to leverage the learning management system to facilitate engaging learning experiences. In a session presented by the American Nursing Association the presenter discussed how they integrated storytelling techniques, utilized self-paced materials, and created games through Brightspace to assist nurses as they continuously work to stay up to speed in a rapidly changing healthcare field. In Getting Started with Personalized Adaptive Learning, a D2L representative delved into the Gartner hype cycle and how it relates to adaptive learning platforms. Adaptive learning platforms are about to hit the enlightenment period of the cycle, reaching full potential. Currently, many institutions are using release conditions within Brightspace create an adaptive learning experience. Pre-tests through Brightspace help to ascertain a student’s competency level and allows students to skip sections of learning content based on their knowledge level. The representative stressed the need for a diverse set of content in order for an adaptive learning approach to be effective through release conditions. In another session, Sinclair Community College discussed how they leveraged the LOR in Brightspace to create single source courses in a variety of formats. They start with an online course master as a base for development and adapt for different course formats from there. Chunks of course content are placed in different modules and those modules are pulled into different course formats. Only IDs and a few faculty who have received training have the ability to edit course content. Meta tags are used to make content searchable and chunking course content aids in monitoring analytics on specific content pieces, helping schools to make improvements to a course. One of my favorite sessions was a lightening round on student engagement. Saint Leo University discussed the use of gamification in a history course. Instructors created a story line with a villain who is responsible for changing history. The goal is to figure out what the villain has changed in history and fix incorrect information. Slippery Rock University integrated RSS and Twitter feeds into course homepages in an effort to draw students in and keep information fresh. They also utilized VoiceThread for introductions, participation in case studies, and contributions to a collaborative class presentation. Finally, Saint Leo University discussed how they created learning innovation at scale. They asked students from across the campus and across disciplines to participate in a mass learning event. Students were asked to apply knowledge from their particular program to help plan and execute a mock presidential debate. They had a large amount of student participation in planning the event as well has hundreds of students who attended the actual event. Here is more information about the project as well as a video from one of the presidential candidates. I really liked this idea because it broke down barriers among different programs and had students apply their knowledge in an experiential way. Overall a great conference! ID&T is always looking out for learning technology innovations. These can be the more recent innovations such as AR/VR/MR, or a remix of existing technologies that create new uses. The Teaching and Learning with Technology Micro-grant (TLTM) program is good for this as faculty can fund their innovative learning technology ideas and pilot in classrooms. This combination of technology remix and the TLTM is what caught my eye at this year’s COLTT conference, CU-Boulder’s wonderful two-day event featuring all things teaching and learning in the online environment. 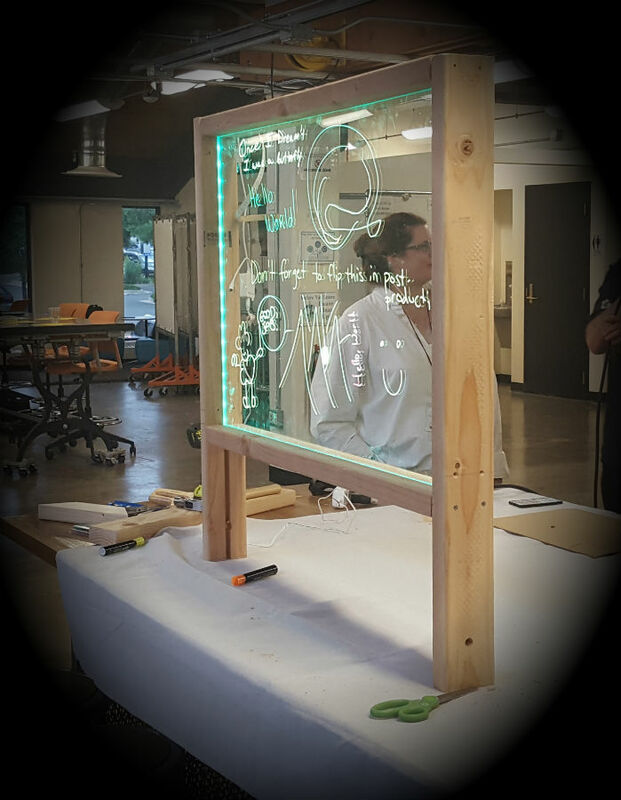 A Regis faculty member applied for and was awarded a 2017-18 TLTM to fund construction of a Learning Glass, an enhanced white board (also known as a light board) with special lighting for capturing whiteboard-based teaching segments. Unfortunately, the faculty discovered that materials costs had skyrocketed well past the $2,000 grant limit, forcing a withdrawal from the project. Enter eLearning Consortium of Colorado members Kae Novak (Front Range CC) and Chris Luchs (CCC Online). For $168, they not only built a working light board but built it live, in front of a sizable crowd, at a COLTT Idea Forge session. Their plan was elegantly simple: use easily obtainable materials, do a proof-of-concept, and let session attendees critique and improve upon the idea. Chris had prechanneled the 2x4s for the plexiglass and purchased the hardware and LED light strip. Then it was putting everything together. Within an hour, and with audience participation, the board was constructed. Once the lights were turned on, the board was ready for attendees to begin testing the board using Expo Neon markers. The results were truly amazing. The light board is something that ID&T will be building this fall. There isn’t sufficient real estate at this time to build a full-sized floor unit so the initial board will be desktop-size. Same functionality with less space on which to write. Huge shoutout to Kae and Chris for proving once again that when it comes to innovative teaching and learning with technology, where there’s a will, there’s a way. There were many excellent sessions to choose from at COLTT 2017. The session I attended that most resonated with my work developing courses with faculty, however, was Applying Cognitive Psychology Research to the Classroom presented by Tim van der Zee, a visiting doctoral student from the Netherlands. Tim facilitated a very engaging research-based presentation in which he shared several effective learning strategies that are based on research that tells us how the brain works. We all learn pretty much the same way--the idea that some people are primarily visual while others are primarily auditory is not actually the case. Variety is the key. All other things being equal, higher intrinsic motivation leads to higher performance...at the same time, when we perform WELL, we are more motivated intrinsically. We like success. Success begets success. Learning takes effort. Rote memorization is a building block that can then serve as the foundation for deeper learning later. Additionally, Tim shared a list of Effective Learning Strategies based on cognitive psychological research that, while not hugely surprising, were very helpful to have in one place. I plan to add these to the list of resources I review with content authors when we begin to develop a course to give them ideas for ways to weave these practices into their course content. Retrieval Practice-recalling information from memory makes you better able to recall it again later. How? Put away the materials. Practice tests. Flash cards, Write summaries not just for simple information, also complex concepts and relationships. Spaced Practice--Spacing out learning over time is more effective than massed practice. 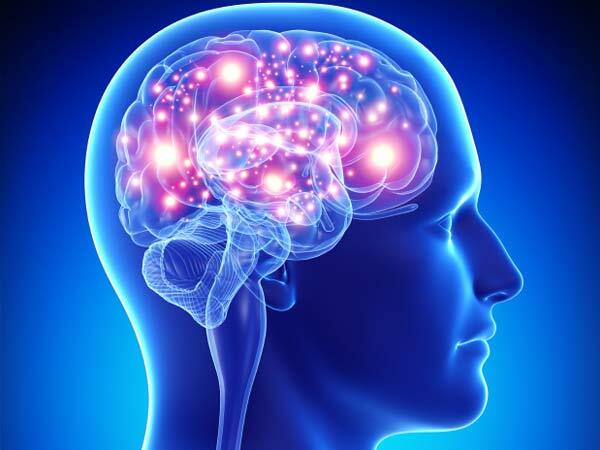 Takes advantage of how our brain uses memory. One hour each day rather than cramming. Don't just re-read. Progress tests. Don't rehearse immediately after learning something. Elaboration and Concrete Examples-Enhance your understanding by connecting information to be learned with what you already know, and expand on it. How? Ask yourself questions. Make connections with what you already know. Identify similarities and differences. Give examples. Do it from memory. Interrogate yourself. Focus on similarities as well as differences. Dual Coding--Have lots of functional ways to represent the same information in different ways. Can do this as you present information and have students create them as well. NOT an either or. Discussion about these learning strategies comprised the bulk of what was covered in the 50 minute session, but I learned enough that I plan to follow Tim on Twitter to see what else he has to share as his research continues! I would have to say that this was perhaps the best Fusion Conference I’ve ever attended. Perhaps the tone was set for me in my first session that was titled “Be a Copyright Ninja” presented by Dr. Thomas Tobin. Tobin used the concept of the Ninja law of secretly serving a cause of one’s own choosing. To that point, he has distilled the muddy waters of Copyright into some simple “rules of thumb” because even the courts and lawyers acknowledge that Copyright is almost a case by case issue. For starters forget these two thing often sighted by faculty as justification or guidance for use of other’s works. The 10% rule – I can use up to 10% of anything and be in compliance of the law. (game show buzzer) WRONG! There is no set amount or percentage anywhere in the law. It’s legal for academics to use anything in the classroom for educational purposes, it’s called “Fair Use”. Again (game show buzzer) WRONG! Fair use is a defense, not a right. You have to make a case for the fair use which has no real definition but just happens to be supported in court again and again. Probably why people think it is the rule. It’s important to understand that Copyright is based on the concept of copying (duh). If you take content from an original source and put it into any fixed format; ripping a DVD, copying a CD, taking a photo of a photo, copying, even mimeographing (remember that?) than Copyright applies and you have to get permission or make a case for “Fair Use”. However linking to or embedding content isn’t copying so Copyright doesn’t apply (so long as the source isn’t violating Copyright in the first place. Did you make a copy of the desired content? YES? Go to step 2. NO? Copyright doesn’t apply. Do permissions currently exist? Is the product licensed or otherwise released through a Creative Commons license agreement. YES? Use the content according to the terms of the license. NO? Go to step 3. Do the PANE criteria apply strongly to your use of the copy? Purpose – You are copying the content for “teaching, scholarship, or research”. Amount – You are copying a representative sample from the desired content. Nature of the work – Prefer factual content over creative, published over unpublished. Economic Impact – Copying the content will not deprive the owner of revenue or profits. If YES use your copy of the desired content according to the PANE criteria. IF NO go to step 4. Is the owner of the content known? YES? Go to step 5. NO go to step 6. Has the owner granted your request for permission to use the desired content? YES? Use the desired content according to the owners grant of permission. NO? Do not use the content. Were you able to discover the owner after a good-faith effort? YES? Got to step 4. NO? Do not use the content or document your good-faith effort to locate the copyright holder if you do decide to use the desired content. So what is the one best piece of advice when considering the use of others published work? DON’T copy it. Look a little harder and try to find a way to link to it. The fact that this conference is so well organized and in our backyard, is one of the reasons I've attended for the past several years. As always every presentation provides good insights and you come away with at least one nugget of information that you didn't have before you attended. The presentation that I want to highlight this year is "Bringing the Right Instructional Tools to the Job" by Dr. Vivian Shyu, Assistant Professor, C/T from CU Denver. At CU Denver they conducted a project that taught the same course in 3 different formats (F2F, Online, and Hybrid), during the same semester and by the same professor. In all three formats they had students rate the same 27 course elements. In this presentation they made it interactive by having participants go to bit.ly/2vy7f9Q and actually complete a portion of the survey. Here, you will be completing a portion of the survey that the students filled out. Please fill out this information as you PREDICT students would report. You will act and answer as a student in one of the FORMATS as assigned below. Students generally prefer F2F. This is mainly because of the interaction and guidance. Students like online flexibility, but see it as disconnected. Summative assessments with Hybrid showed the biggest improvement, but also started lower. Half the students in the Hybrid course didn't realize they were signing up for a Hybrid course or what it meant. With F2F students struggle with, do I go to class or do I use Canvas? I believe Hybrid/Blended courses are an aspect of learning that we haven't explored enough. I'm not sure what percentage of our courses are Hybrid, but I am thinking it is very low. Interaction being critical is not new, but we need to work on making sure that our online courses are designed in a way that creates the opportunity and encourages all the aspects of interaction. I think having standard formats really helps with the guidance. Even though they were very clear on the different formats: Online = 100% Asynchronous, Hybrid = 60% Asynchronous, and F2F = 100% Synchronous, it wasn't clear to the students. I'm concerned that Regis doesn't have consistent criteria for what is considered "Online" or "Hybrid". This can really add an aspect of confusion for the students. We really need to pay attention to the fact that F2F students struggles with when and how to use the LMS. My suggestion is, if it is a F2F class, course content in the LMS should be considered supplemental material and only required if the facilitator specifically refers to it. In a F2F class the LMS should be used for assignment submissions, grading, and communication as determined appropriate by the facilitator of the class. I am happy to discuss any or all of the above in more detail. Just let me know.